Laureate Education Inc. is reported to be preparing for a $1B float in the USA. Torrens University Australia is part of Laureate and so presumably will form part of what is floated. Torrens is interesting also because it is effectively Australia's first on-line university. Torrens is required to report on its first year of operation in Australia by 30 June. Torrens is part of the South Australia government's experiment in Offshore Higher Education, which has not gone well, with University College London (UCL) already deciding to close its Adelaide campus (Torrens and UCL were sharing a building with Carnegie Mellon University Australia). EdX, the on-line course consortium and Arizona State University have announced "Global Freshman Academy", offering introductory university courses. These differ from previous edX courses, being for credit, so they can count towards a university degree. The "Verified Certificate" costs $45 in advance, plus $200 per credit hour if the student passes the course. The course "Introduction to Solar Systems Astronomy" is 4 credit hours, making the total cost of that course $845. Other courses offered initially are Western Civilization: Ancient and Medieval Europe (3 credit hours), Human Origins (3 credit hours). There is also a demonstration course "Welcome to Global Freshman Academy". An unusual aspect of the Astronomy course is that it is only 8 weeks long (not the more typical 13 weeks for a university course) and requires 18 hours work by the student per week week (not the usual eight to ten hours). As an on-line student myself I have found a course requiring eight to then hours difficult to do while having a day job. This seems to be a common experience and the trend for such on-line courses has been to make them shorter (down to four hours) with less student work per week (as little as four hours), not more. An interesting aspect of the new edX Global Freshman Academy is the status of the students. Previous edX students were not really students, as their courses were not for credit. However, these for-credit courses would need to be subject to all the usual university, state and national government rules and laws. The cost of administering these rules and laws would need to be taken into account in working out the fees for the course. As an example, the university has to have courses run thorough a quality control process and students have a right of appeal over their results. The fees for these courses may need some further explanation. Arizona State University fees foe non-edX courses are $1,993 for 4 credit hours to a Nonresident Online Tuition student. This is more than twice as much as the edX fee. Of course the edX course only costs $45, so if most students fail the edX course it will be cheaper than a regular one for them (the success rate for these type of on-line courses has been low: about 10%). However, in a well designed conventional on-line course progressive assessment is used and a student will know if they are unlikely to pass and be able to withdraw (and get at least a partial refund) before the end of the course. The Australian Minister for Education and Training, Christopher Pyne, has released a "Draft National Strategy for International Education: For consultation" (PDF, 1.4 Mbytes, 84 pages, April, 2015). In my view the strategy does not place sufficient emphasis on the importance of on-line education, without which Australian education providers will not be viable. "International Education" for the purposes of this strategy is higher education, vocational education and training (VET), school education and English language tuition, with study in Australia, offshore university campuses, and online educaion (including massive Open Online Courses). The strategy does not define what an "international student" is, but presumably these are those who are not Australian citizens and not permanent residents. The document points out on page 5 that international education is Australia's largest services export ($16.3B for 2013–14). Strategic action 3.2 "Rejuvenating language study"
Strategic action 4.3 "Building lasting connections with alumni"
Strategic action 6.1 "Leading good practice in new modes of delivery, including online"
New information and communication technologies are fundamentally changing the way people access information, knowledge and experts. These technologies can offer institutions, students and researchers flexible opportunities for teaching and collaboration irrespective of physical location. Online learning helps Australian institutions reach students overseas who may not be able to study in Australia. The Chaney report stated that new delivery models will likely include increased transnational delivery, online or distance delivery and tailored courses for professionals with discipline or organisation specific content. The Coalition’s Online Higher Education Working Group also examined the potential to grow online education in its report Higher Education in the Digital Age. The Government’s response to the report is at Appendix D.
Universities are also considering digital credentialing as a way of recognising skills and achievements that happen within and beyond formal contexts. For example, in 2014, Deakin University announced that it would use a fee-based process to audit an individual’s prior learning and award them badges on the basis of that assessment. The badges could be counted as credit towards Deakin University degrees. This is a potential avenue for the next generation of MOOCs. While there are many opportunities to increase online teaching and learning to reach new and growing markets, there are also challenges. Presenting online courses requires significant resources, including capital investment, ongoing maintenance and equipment upgrades to remain relevant and competitive. Training academic staff to use new technologies is a further cost. Foreign governments and employers may have negative perceptions of graduates who have completed a course solely online. Employers also tend to value graduates with skills in team work, group problem solving and interpersonal communication gained through face-to-face modes of delivery. Developing a competitive advantage in this area will require careful consideration of all these issues. Projects funded by the Office of Learning and Teaching (OLT) are encouraging the collaboration of partner universities to investigate innovative teaching and learning practices in technology enabled education. Sophisticated and innovative online resources have been created as a result of OLT funding and are publically accessible and can be embedded into the curricula of institutions. The Government is also providing funding of $24.6 million to 13 projects that are trialling the delivery of innovative education and training practices through the Broadband Enabled Education and Skills Services programme. The dramatic rise of Massive Open Online Courses (MOOCs) has shown that the barriers to institutions sharing online content are breaking down. Universities are offering high-quality online content for free, attracting international interest. MOOCs are also a way for students who may not have previous tertiary education and may have confidence barriers to formal study to access learning opportunities. For example, the first iteration of the University of Tasmania’s “Understanding Dementia” MOOC attracted 9300 registrants from more than 60 countries worldwide. Unlike many MOOCs, it did not suffer from dramatic drop-out rates: more than 67 per cent of participants who started the course were still studying after four weeks. The course has also focused world attention on a strength of the University of Tasmania: research around social justice. supplement online education with experiential learning, such as videoconference discussions and webinars, as well as opportunities for residential programmes, internships or work experience. as part of the review of the ESOS framework, consider increasing the flexibility for some types of courses on the Commonwealth Register of Institutions and Courses for Overseas Students as appropriate for distance and online learning. undertake more analysis of the demand for online education. Greater take-up of Australian qualifications provided through distance education and online. Appendix D of the report is a long awaited "Australian Government response to the Coalition’s Online Higher Education Working Group"(page 75). Unfortunately the response essentially just says that the government has removed regulatory burdens from universities so they have "the freedom to innovate: including for online education. There are no specific initiatives for online, or any other form of education, in the repose. Please outline your (or your organisation’s) interest in Australian international education. Add any other relevant content. Response: Does the vision statement in the draft strategy represent Australia’s aspirations for international education? Are any significant goals for international education not adequately covered? Can you identify the strategic actions which best support your goals for international education? What are the best measures of success for international education? What would you like to see progressed as a priority for the strategy in the first year? Is there anything else you would like to raise that will help develop the final National Strategy for International Education? Unfortunately the strategy does not show an understanding of the transition to online education now taking place. The report is based on the assumption that online education will be the last choice of students, who can't get education any other way, when it is becoming the first choice. This is compounded by a lack of understanding of what online learning is. Page 50 says: "supplement online education with experiential learning, such as videoconference discussions and webinars", suggests the authors do not understand that webinars are already a routine part of online learning. Within the next five to ten years blended learning will be routine from primary school to university. Primary school students will need more time in a face-to-face classroom and attention from teacher, but older students will need less attention. Australia will still require school and university campuses, but less of the education will take place there. As a result the approach of the Australian strategy for international education needs to be "flipped" tread on-line education as the central issue, not a peripheral one. As currently formulated, the strategy assumes that Australian institutions can keep delivering education much as they have and remain competitive. The education strategy makes the assumption that the domestic Australian education market is secure from international competition, having a local natural monopoly. However, even where students still attend a physical local campus, much of their instruction will be delivered on-line in the classroom and can be sourced from anywhere in the world. If Australia does not have a strategy for creating this content, then Australian schools and universities will be reduced to the role of places for delivery of overseas content and collection of fees to be sent overseas. An example of this new world is Torrens University Australia. This registered in South Australia, so that Australian students can qualify for government subsided study loans. However, Torrens is able to source on-line course materials and tutors from its worldwide Laureate International Universities network and is under no obligation to employ staff in Australia to design or teach courses. The draft Australian Strategy for International Education assumes Australians will keep buying classroom education and this can be the base for an export industry. This has similarities to past government car industry policy, which assumed Australians would keep buying large family cars and some could be exported. Australians stopped buying large family cars and Australian automotive manufacture is ending. Similarly, if Australians stop buying on-campus education there will be no basis for an education export industry. Australia will become a net importer of education, just as it has become an importer of cars. The not-for-profit StartupAUS has released "Crossroads 2015: An action plan to develop a vibrant tech startup ecosystem in Australia" (April 2015). What got my attention is that Alan Noble, Engineering Director for Google Australia, is on the StartupAUS board. The Griffin Accelerator in Canberra is mentioned in the report (page 11), but other Canberra based initiatives, such as Innovation ACT and Canberra Innovation Network (CBRIN) are not mentioned. From: Crossroads 2015: An action plan to develop a vibrant tech startup ecosystem in Australia, StartupAUS , p. 9, April 2015.
ps: I will be speaking on "Innovations in teaching innovation", at the CSIRO ICT Centre, Center, Australian National University in Canberra, 4pm, 27 April 2015 (draft presentation available). In "Equipping kids with digital skills key to future success" (The Australian, 15 April 2015), Brenda Aynsley OAM FACS, President of the Australian Computer Society, points out that free on-line courses are now available for teachers, to help them with the new Digital Technologies component of the Australia curriculum. The course are run by the Computer Science Education Research Group (CSER), at the University of Adelaide. The next CSER Digital Technologies Course starts 1 May 2015, for those teaching years 7 and 8 (but others are encouraged to take part). As I am a student of education, I have registered to take part. One of the most useful aspects I have found of such courses is to remind me (as a teacher) of how hard it is to be a student. Also it is useful for teachers to familiarize themselves with how on-line courses are run, as this will be the way they will teach their students in the future. Jemma Ward writes "Teaching is a profession, not a calling" (The Forum, 14 April 2015). She suggests that teaching portrayed as a "calling" and therefore teachers are expected to work long hours for low pay. But I suggest their problem is of the teachers own making and they have the means to fix it. Many teachers are devoted to teaching and that may be the problem with education. Teachers would do better, for their students and themselves, taking a hard-headed approach. The "educator martyr complex" exists even in higher education, where the pay is better than schools. What lecturers and teachers should be focusing on is making teaching more efficient, effective and so less frustrating for them. After giving guest lectures at university I became fascinated and frustrated by the teaching process, with its lack of rigor and efficiency. Then I discovered the e-learning/distance education revolution. Being able to teach from home, or the other side of the world, is only part of it. The real revolution is in designing education to use student and teacher time efficiently, in the classroom, or on the Internet. As an adjunct lecturer, I can't sit around complaining of not being paid much, as when not teaching I am not paid. So I spent years (and $10,000) learning to teach efficiently. Talking at students for an hour is not efficient. So modern teaching uses presentations broken up into segments of six to twenty minutes. It makes no difference if these presentations are live or recorded. Students learn better when tested regularly. So I have started using short weekly automated quizzes (chosen at random for each student, to stop them cheating). Students learn well when explaining to others, so I also have students discuss topics in an on-line forum. Ultimately the student must be tested with a large item of work. Marking such assignments can be done much more quickly using "rubrics" (detailed marking tables). Getting stuff to and from students is easier using Learning Management System (LMS) software (I use "Moodle", a free Australian product). A team of ANU computing students is working on my "Better Webinar Tool For Teaching" concept. The aim is to produce a free open source webinar plug-in for Moodle. The key feature of this is to be that the student can pause a live video/audio session, just as they can time-shift a live-to-air TV broadcast, using a Personal Video Recorder (PVR), such as a TiVo. The idea would be that if you, as a student, are interrupted while taking part in a webinar, you can press "pause", go away for a few minutes (or days), then come back and resume your participation. On the face of it, adding a pause to webinar software does not sound like much of an advance over products, such as Adobe Connect and Blackboard Collaborate. Those products already provide the option of viewing a recording after the webinar is over. However, the subtle point is that a pause function in a live webinar blurs the distinction between synchronous and asynchronous e-learning. The function may be technically not too hard to implement, but what does it do to the pedagogy? Webinar products allow students to do more than just watch a video conference. The student can actively participate by typing in text, responding to multiple choice questions, by speaking and being seen. However, these interactive functions are only available during the live webinar, students cannot interact using the recording after the webinar is over. Such interaction makes no sense in terms of a fixed recoding of a completed synchronous learning event. Participation after a delay is normal for asynchronous e-learning. Products, such as Moodle, provide functions for students to interact minutes, hours or days apart. Why can't these same functions be used for a synchronous mode? If you missed the live webinar, why can't you still answer the quiz and type in some comments? There may be some limits place on how long after you can participate in an event, for reasons of practicality and pedagogy. Time limits on student participation are are normal in education [a concept I explored at length in the paper Worthington, (2013)]. But there is no technical reason why the student has to use different software for synchronous and asynchronous modes, or why there needs to be any firm division between the two. Explicitly allowing for delays may also ease some of the technical constraints on webinar software. Video and audio conference systems normally try to present content in "real time", requiring buffering of the data and delays beyond those inherent in the telecommunications system. An asynchronous system could present information as soon as it is available, even if it is out of sequence. Research shows that people tolerate such mis-ordering if it happens only over a few seconds (and those watching a later recording could have it resequenced). What seemed to me a relatively simple concept is something I have spent several years trying to explain, to colleagues and to students. My latest attempt is with the PVR metaphor, using the term "Time-shifted Learning". A paper on this is in preparation for later in 2015. Before settling on "time-shifted" other terms I considered were "pausable" (too clumsy) hybrid (already used as a synonym for blended), time in various ancient languages (already used as product names) and Synchromodal (already used for the combination of live classroom and synchronous learning). ps: A simple pause function on webinars could also be used as a replacement for lecture recording software, such as Echo 360. A recorded lecture could be thought of as a webinar with no one watching live. Such a function would still be superior to a simple recording, as it would still allow the class to interact later. Innovation requires the ability to recognize the opportunities provided by technology and know how to exploit them in business. The aim is more efficient and effective organizations, be they for-profit or not, existing or new start-ups. This requires documented investigation, analysis and review. A methodical investigation of functions and processes, requirements, costs, sustainability and business benefits is needed, with specifications and acceptance criteria. The purpose of this document is to provide an instructional unit to be offered on-line, for university students undertaking initially for students in the Australian Capital Territory (ACT), Canberra. The unit is designed for students in the third year of an undergraduate university STEM program (science, technology, engineering or mathematics), or advanced students undertaking a STEM component, such as those taking part in innovation competition. These are the notes for a course in innovation, which requires the ability to recognize the opportunities provided by technology and know how to exploit them in business. The aim is more efficient and effective organizations, be they for-profit or not, existing or new start-ups. This requires documented investigation, analysis and review. A methodical investigation of functions and processes, requirements, costs, sustainability and business benefits is needed, with specifications and acceptance criteria. The learner will be able to prepare a plan (goal) to exploit business opportunities provided by IT, for more efficient and effective performance (conditions) of an existing or new businesses, at a skill level equivalent to SFIA Version 5, Level 5, "Innovation" INOV (Standard). The learner will document an analysis of a business in terms of functions and processes (goal), by identifying and quantifying improvements to reduce costs and enhance sustainability (conditions) in accordance with the specifications and acceptance criteria for information and communications system, at a skill level equivalent to SFIA Version 5, Level 5 "Business analysis" BUAN (Standard). The Skills Framework for the Information Age (SFIA 2015) provides a common reference model for the identification of the skills needed to develop effective Information Systems (IS) making use of Information & Communications Technology (ICT). This course targets SIFA Level 5 competencies: "ensure, advise ... Works under broad direction ... Influences organisation, customers, suppliers, partners and peers ... Performs an extensive range and variety of complex technical and/or professional work activities ... Advises on the available standards, methods, tools and applications ..." (SFIA, 2015). "The capability to recognise and exploit business opportunities provided by IT, (for example, the Internet), to ensure more efficient and effective performance of organisations, to explore possibilities for new ways of conducting business and organisational processes, and to establish new businesses." From: Skill INOV, Category: Strategy & architecture, Subcategory: Business/IT strategy and planning, SFIA (2015). From: Skill BUAN, Category: Business change, Subcategory: Business change management, SFIA (2015). It is assumed that the learner is in the third year of an undergraduate university STEM program (science, technology, engineering or mathematics), graduate/postgraduate, or advanced students undertaking a STEM component. It is assumed the learner is undertaking a project course, such as ANU TechLauncher (Australian National University, 2015), or is an entrant in an innovation competition, such as Innovation ACT (2014). Terminology from the innovation field is used (with a Glossary), but apart from this standard international English, as could be expected from a university student at IELTS 6.5 for Academic Reading and Academic Writing (IELTS, 2011). To complete the subject the learner is expected to take 12 weeks, with eight to ten hours study per week. Self-instruction units in the course are each expected to take one to two hours. The upper limit is based on a reading speed of 80 words a minute for a student at IELTS 6.5 (McEwan, 2012, p. 80). The final mark is made up of 10% for the Quizzes, 20% Forums and 70% assignments. To pass overall, it is necessary to pass in both areas of assessment: quizzes/forums and project assignments. Note that the weighting of the assessment items and pass level is set by the particular educational institution offering the unit. Check the institution's policy for details. The course has been designed using the instructional strategies outlined in Smith and Ragan (2005), for delivery via computer, using a web browser. They are designed to be delivered in non-real time (asynchronous) mode for distance education. The course includes self-instructional units, with automated quizzes. However, the project assignments are expected to be assessed by a human tutor. Also legal and ethical considerations may require those offering this course to have a human tutor overseeing the self-instructional units, to ensure the learners are safely and correctly instructed. The materials for this course have been designed to be efficiently encoded so they can be used over a low bandwidth Internet connection on a tablet device or smart phone for remote users in developed nations and in developing nations with limited infrastructure (at dial-up 48.8 kbps). The course uses HTML web-based content for a learning management system (LMS), however, the materials are designed to be about to be printed for delivery on paper for use in a classroom. Tom Worthington is a private computer consultant, who also does some part time teaching at tertiary institutions. He started as a computer programmer and later IT policy writer in the Australian government. I then left to be an independent consultant and teach computer students part time. As well as being an Certified Computer Professional (equivalent to the Canadian CPIS Information Systems Professional), he has a Graduate Certificate in Education from an Australian university and an Australian Certificate IV in Training and Assessment. Tom's liability is limited by a scheme approved under Australian Professional Standards Legislation. The notes for this course are to be published on paper and electronic formats as "Introduction to Innovation - Commercialisation and Entrepreneurship in Technology". Further readings, most of which are available on-line, are detailed in the notes. Learners may be provided with a copy of the notes via a Learning Management System. This is the third pre-release version of the notes (version 0.3). Version 0.1 was a draft description of the course. Version 0.2 provided details of just the introductory unit. Version 0.3 has more course level details. Corrections, suggestions for improvement and comments to the author would be welcome. "An innovation is the implementation of a new or significantly improved product (good or service), or process, a new marketing method, or a new organisational method in business practices, workplace organisation or external relations." From OECD/Eurostat (2005, p. 46) emphasis added. This is the first unit of a course in "Commercialisation and Entrepreneurship in Technology". The learner will document an analysis of a business in terms of functions and processes (goal), by identifying improvements (conditions), at a skill level equivalent to SFIA Version 5, Level 5 “Business analysis” BUAN (Standard). This objective is based on the skill "Business Analysis" (BUAN) from the Skills Framework for the Information Age (SFIA 2015). See "About the Course" for further details. Contributions to a discussion forum, peer assessed, for half the assessment total. To be able to innovate, you need to first know what innovation is, what types of innovation there are and where they can be applied. Here you will learn some international definitions of forms of innovation. "Innovation activities are all scientific, technological, organisational, financial and commercial steps which actually, or are intended to, lead to the implementation of innovations. Some innovation activities are themselves innovative, others are not novel activities but are necessary for the implementation of innovations. Innovation activities also include R&D that is not directly related to the development of a specific innovation." From OECD/Eurostat (2005, p. 47) emphasis added. While the OECD likes to collect statistics for these neat categories, in order to innovate it is likely that your innovation will fall into several categories. As an example an organizational innovation which gives more workplace autonomy for decision making might be implemented through software and an on-line forum, making it a product innovation as well. One point of difference is that OECD/Eurostat (2005, p. 56) argues that "It is not an innovation to stop doing something, even if it improves a firm’s performance.". However, removing unnecessary work practices and processes can be a significant innovation. New to the world: "An innovation is new to the world when the firm is the first to introduce the innovation for all markets and industries, domestic and international. New to the world therefore implies a qualitatively greater degree of novelty than new to the market." From OECD/Eurostat (2005, p. 58). Disruptive or Radical innovation is "an innovation that has a significant impact on a market and on the economic activity of firms in that market." (OECD/Eurostat, 2005, p. 58). The impact of innovation may be great even where it is not very novel. As an example, the effect of the use of on-line social media tools have on the way organizations are managed is still being worked out today, even though such tools are not new. Schubert and Williams (2013) trace the use of social media in business over the last six years and comment that so far 'the most popular usage scenarios of the software are not very “social” but support people in their daily joint work with a focus on getting the job done', so there is scope for further disruptive innovation. "Successful in having resulted in the implementation of an innovation (although the innovation need not have been commercially successful). Ongoing, for work in progress which has not yet resulted in the implementation of an innovation. Abandoned before the implementation of an innovation., while a product or process innovator is defined as a firm that has implemented either a product or a process innovation." A willingness to collaborate across organisational boundaries. Kirk and Cotton (2012) also point out the value of "Soft-starts, where technology is developed within a company before being spun-out, has also successfully de-risked technology for many investors". One of the most succesful Soft-startsat Cambridge has been microchip designer Advanced RISC Machines Ltd (ARM Ltd). Acorn Computers Ltd. researched the use of RISC technology for low cost, low power, home computers (Garnsey, Lorenzoni & Ferriani, 2007, pp. 125-127). Acorn's home computer market seemed assured by winning the contract to provide the BBC Micro, a computer for home education, but sales declined from the mid 1980s. ARM Ltd was formed to exploit the work on RISC technology for portable devices and now powers many of the world's smart phones and tablet computers. A more recent Cambridge start-up is the Raspberry Pi Foundation, a non-profit foundation which has designed a new low cost education computer, the "Raspberry Pi", using the ARM technology (Garnsey, Lorenzoni & Ferriani, 2007, pp. 132-133). Unlike Acorn, which sold computers through retailers, or ARM which licences intellectual property to chip manufacturers, the Raspberry Pi is sold on-line. Co-working space: with open plan office space for 35 people (Entry 29, 2012). This allows a new start-up to to have room for a small number of employees and also call on the skills of others in the space. This includes the Public Sector Landing Pad program (PSLP) for former government employees to start a new business. Accelerator: business advice and staff training usually given in return for a share of the start-up business equity (GRIFFIN Accelerator, 2014). "Openness - We work in the open, sharing learnings broadly to support participation in innovation and drive new, better thinking. Leadership - We demonstrate and influence change towards new ways of working. Collaboration - We co-create with a range of partners. Agility - We are problem solvers in the business of funding trials. A cycle of iteration, adaptation and learning will be the foundation for our progress. "The DTO will comprise a small team of developers, designers, researchers and content specialists working across government to develop and coordinate the delivery of digital services. The DTO will operate more like a start-up than a traditional government agency, focussing on end-user needs in developing digital services." From Department of Communications (2015). To innovate you will need to implement new or improved products, services, processes, marketing or organizational structure. The innovation can be new to the firm, market or the world. Innovation can be disruptive (radical), but does not need to be. The implementation of an innovation can be successful, ongoing or abandoned. The area around the City of Cambridge (UK), "Silicon Fen", shows an example of where such innovation has developed. Acorn Computers Ltd, ARM Ltd and the Raspberry Pi Foundation show how innovations can build on each other, with research, education, innovation and commerce flourishing, even when not all the companies involved survive. Before the readings, attempt the quiz. How Innovation is Changing in Europe: an interview with OECD's Andrew Wyckoff (2013). Viewpoint: The Cambridge Phenomenon, five decades of success (Cotton & Kirk, 2012). OECD Definitions Suitable for Business? : The OECD definitions of innovation are used by government agencies collecting statistics. Are these definitions suitable for use by business. Select one definition, say if it is suitable, or not, and justify your answer. Cite at least one source to support your argument. Innovation in Cambridge and Canberra: Many cities have tried to emulate "Silicon Fen", the high-tech start-up area around Cambridge University UK. 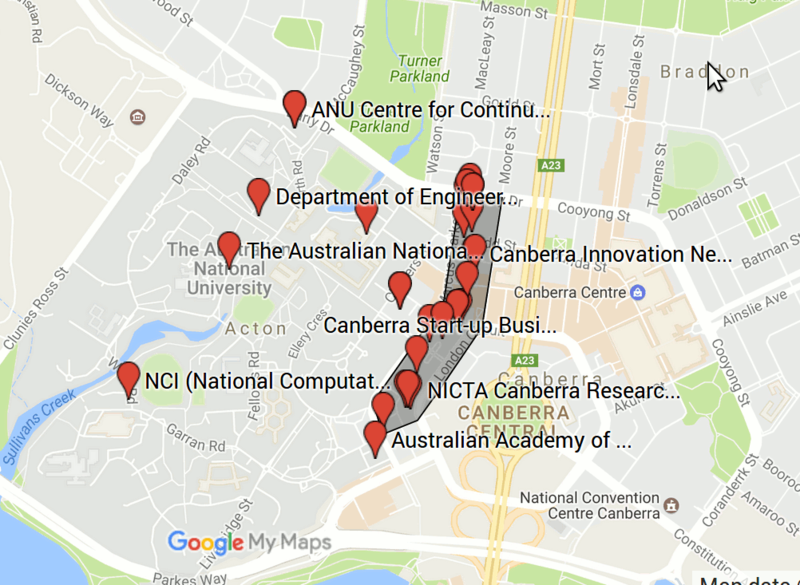 What does Canberra's attempt have in common with Cambridge? What is different? Post an answer to each question in the forum. After answering each question, rate and reply to an answer from another student for each topic. Read the course notes and the additional readings before attempting the assessment. Quiz: Five automatically scored multiple choice questions. Contributions to discussion forum: peer assessed by your fellow student for half quarter of the assessment total. You can have three attempts at the quiz, with the best result recorded. Questions are selected at random from a question bank, with each learner receiving a different quiz, on each attempt. Submit an answer of no more than 140 words, to each of the discussion questions in the Discussion Forum, before reading the answers from other students. Read the answers from at least one other students, rate them (either "Competent" or "Not Yet Competent") and submit at least one reply to a posting your fellow students in the Discussion Forum. These terms are from OECD/Eurostat (2005), except where otherwise indicated. "A marketing innovation is the implementation of a new marketing method involving significant changes in product design or packaging, product placement, product promotion or pricing." From OECD/Eurostat (2005, p. 46) emphasis added. "An innovation is new to the world when the firm is the first to introduce the innovation for all markets and industries, domestic and international. New to the world therefore implies a qualitatively greater degree of novelty than new to the market." From OECD/Eurostat (2005, p. 58). High technology industry around Cambridge University, UK. OECD (2011), Charting innovation. OECD Publishing, Paris. Greetings from the Australian National University where Jillian Broadbent, Chancellor of Wollongong University is speaking on "Will she be right? Macro and micro observations on economic policies". Chancellor Broadbent pointed out that universities are a major Australian export industry, with UoW having more offshore than onshore students (the "tipping point" was reached in 2012). She pointed out that universities currently cross-subsidize between faculties and also subsidize research from student education fees. Chancellor Broadbent suggested that a new model was needed for university funding, but the matching of private to public investment can be "overplayed". She pointed out that the USA's private investment in university research is underpinned long term government policy and supported by large scale government funding through the health, defence and energy departments. Chancellor Broadbent drew particular attention to US Defence's DARPA, which funds research which can then be taken up by the private sector. She emphasized that government leadership and investment in research was essential alongside the private sector. Chancellor Broadbent then discussed her role in establishing the Clean Energy Finance Corporation (CEFC). She pointed out that superannuation funds are reluctant to invest in the type of initiatives the clean energy fund was set up for. One of the more unusual investments of the CEFC was solar powered tomatoes. Chancellor Broadbent commented that Australia was adapting to a Chinese tourism boom, with Chinese signs in Brisbane and squat toilets on the Great Ocean Road. At question time I asked Chancellor Broadbent if a Productivity Commission inquiry into Australian universities was needed before the cap on fees as removed. She replied that Universities Australia had done some work on productivity and that an inquiry would be useful to show the public what universities provide and that they are productive. Later I found there have been Productivity Commission inquires into University Resourcing (2003), Exports of Education Services (1991), and Vocational Education and Training (2011 and 2012). But no inquiry into universities, or higher education, in general. Media reports indicate that sophisticated fakes are being sold of Australian university degrees, complete with university seals. There is no easy way to make an unforgeable paper document. A much more secure approach is to issue certified digital documents, as ANU now does. Shown is my my ANU Graduate Certificate in Higher Education (at low resolution and with the signatures blurred, so as not to help the forgers). The ANU certificates are distributed through the Digitary service, which was a spin-off of Dublin City University. Instead of providing a certified paper copy or a scan of it, students can provide a hypertext link to the document in the on-line service. Copies printed from the service have instructions on them of how to verify the details. Greetings from the famous room N101 in the Computer Science and Information Technology building at the Australian National University in Canberra. I am helping teach "Systems Engineering for Software Engineers" (COMP3530 and COMP6353). This week's topic is Sustainability. , with Dr Lorrae van Kerkhoff, from the ANU Fenner School of Environment and Society and myself, Tom Worthington, from the ANU Research School of Computer Science and member of the ANU Climate Change Institute. This may seem a strange topic and speakers for a software engineering course, but there is little point in just teaching the students to build a new App with dancing cats. As professionals the graduates need to be worrying about the social effects of what they do. I ask the students "How Green is My Computer?" and talk to them about ICT Sustainability. The issue for me is how to address environmental concerns while meeting social goals.